If you would have ever asked me if I was going to start a blog, my answer would have been that I was planning on it ... Well, I planned on it for YEARS.. I looked through blog magazines, craft magazines, online, and from links on Facebook. The impetus for me actually starting one finally was the opportunity to try out for the Mountain Plains Crafters Design Team. Started by 3 women -- Pam, Terri & Sheryl -- it was going to be a place to share ideas, be creative, try new products and have fun... My blog grew from there-- a place for me to show my projects, try new techniques and make many new friends.. It has been exactly 1 year since my first post, aptly titled "And So It Begins"... I want to celebrate my first year by giving away some of my favorite products,. 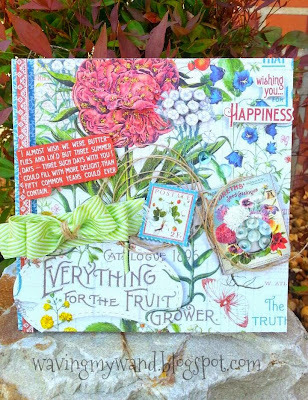 Unity Stamp Company, We R memory keepers & anything Tim Holtz are just a few of my GO-TO companies for supplies.. Adornit has given me hours of fun with their Art Play Paintables by Lindsay Ostrom. You can see from my blog posts how many amazing sponsors I have been privileged to work with.To win, all you have to do is comment on this blog post.. I will randomly choose 3 winners. I've also invited some friends that I have met along the way to post on my Facebook timeline for my blogoversary. Not everyone has a blog, BUT I have met some terrific crafters on Facebook and wanted to give them the opportunity to show their creations... I will share any blog links that I get from friend's posts..
My card celebrates my 1st year of blogging... The sentiments are from Unity Stamp Company and were perfect. I was INSPIRED by so many people and their wonderful creativity, IMAGINED that one day I would have a blog with which to share my own creativity and CREATED Meticulosity which has led me on an amazing journey. I want to keep building on those 3 words during my second year ( and weren't those cute buildings just what I needed to express that !! ).. During my second year, I want to use more mixed-media techniques, try out a new look for my blog background, work on my journal and STAY out of my comfort zone. I hope you will continue on this journey with me.. I couldn't have made it through this first year without all of your support..
Well said Deb. Congrats on a wonderful, first year! You are such a kind, caring, sweet lady and I wish you all the bloggy happiness in the world! Thanks for sharing your creativity (and fabulous coffee!) with the team at MPC and with the crafting world. Hugs! Terri, you are a wonderful friend !!! Thank you so much !! Love it my crafty sister - happy blogiversary! I'm so very, very glad you joined us. Thanks, Jenn--my crafty sister from another mother !!! So am I !! YAY for Debra! :) Congrats on your blogoversary! Here's my link celebrating with you..
Love it Angeline! You rock! Wahooo Deb! Thanks for inviting me to join in your celebration. I wish you more & more success in the future with your blog & your crafting! Here's a big *HUG* Love you lady! Love you too, Paula !! I need to soak up some of your mixed-media talent !! Appreciate your support of Meticulosity !! Thank you for all of your inspiration and for enabling my card-making obsession .... You are an amazing person !! Love you AND Unity !! Happy Blogaversary to you!!!!! ♪♫♪♫ I hope you have many many more! Happy anniversary. Congratulations on one year down and many more to go. Like you I've thought of starting a blog but I have so much fun visiting other people's blogs that I don't think I'd have the time. I already spend too much time on the computer. Glad that you took the plunge and have brought us so many great projects. Thanks. congrats on your first blogoversary!!! awesome!! hope you celebrate many more ones!! These are lovely cards!!! Happy blogiversary and many, many more to come!!! You are a sweetheart and I appreciate your kindness and frienship. I hope you are able to achieve beyond the goals you set for yourself...keep crafting! Happy 1st year blogaversary!! I still haven't taken the plunge into blogland but I LOVE to browse and follow crafty blogs and am always inspired! I came over here from Angeline's blog to help you celebrate and am eager to start checking out your posts! Congrats to you on 1 year of blogging! Looking forward to seeing what the next year brings! I always enjoy seeing your beautiful projects! Perfect card to celebrate your one year blogiversary! Happy Blogaversary!! I just became a new follower. I love the border and ticket! Happy blogiversary Debra! I'm so glad I have you as a fellow crafty friend (who also loves coffee as me)! 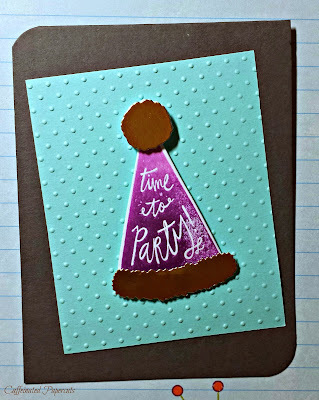 Your card is so fun and colorful and what a great way to use those Unity sentiments! I really love the quirky background too! Congratulations on your blogging anniversary!!! Happy 1st Anniversary! Hoping you have many more ahead of you. 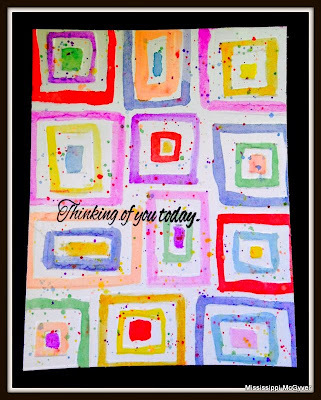 LOVE your card (the background is divine!). Congrats on your first Blogaversary!!! Here's to many more years of enjoyment!!!! Congrats, dEb! I'm always impressed with your creativity. Keep inspiring others!!! HAPPY first blogging anniversary to YOU!!! You are such an inspiration - I love how creative you are and how I enjoy your blog and YOU more than I could ever imagine!!! Best of luck in the coming year and thanks for the sweetness you offer - love that I was led by you to the Postcard Project - great ideas come from here!!! Happy blogiversary! Good luck on many more to come. TFS. Happy First Blogiversary! What a great milestone to celebrate! Congrats or your 1st blog anniversary. 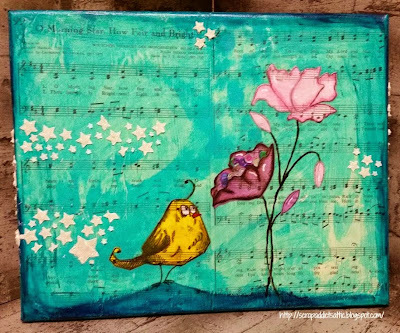 Thanks for sharing your wonderful crafting inspiration.